Do you think we can fix this in five months? As if the government couldn’t get any more depressing, we’re welcomed with another disappointment. Last Saturday (May 19), Environment Secretary Roy Cimatu was checking for violations of environmental laws in Boracay when he discovered that one of the biggest violators was the government itself. The sewerage pipe, which was installed by the Philippine Tourism Authority (PTA), has at least 70 manholes along the beach. In a report by Inquirer.net, Cimatu said that overflows from the drainage pipe through the manhole contaminated the waters and contributed to the proliferation of algal bloom. 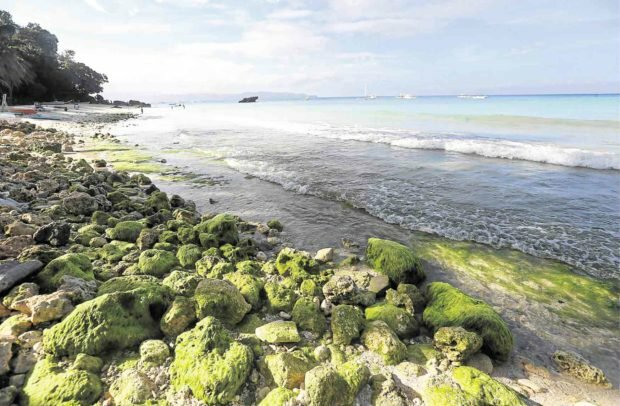 A closer look: part of a beach near Westcove Resort in Boracay covered in algae. A test made on a part of the septic tank connected to the PTA sewerage pipe showed coliform level amounting to 74,000 most probable number (MPN) per 100 ml. The safe level of MPN is 100 for waters used for swimming and 200 for waters used for boating. Coliform bacteria are unlikely to cause illness, but since they’re found in the environment and feces of all warm-blooded animals and humans, their presence in drinking water or others indicates that disease-causing organisms (pathogens) are in the water system. Many residents argue that algal bloom is a natural phenomenon, but scientists said that an excessive amount of it was already an indication of water pollution. “We still have time,” Cimatu said, referring to the President’s approved closure of the island for six months. He says it’s fortunate that they discovered the problem before the reopening of Boracay. On the same day, Cimatu signed an agreement with business groups for the strict enforcement of a municipal ordinance requiring lodges with more than 50 rooms to have their own sewage treatment plants. Establishments with fewer than 50 rooms should still have sewage treatment facilities or share them.